Decluttering. The very word causes people to feel overwhelmed, anxious, and tired at the thought of all the work that lies before them. When I began my decluttering journey, I had two children under the age of two and was drowning in things. I felt like all I was doing was cleaning, or putting things away or finding room for things within in a very, very small space. 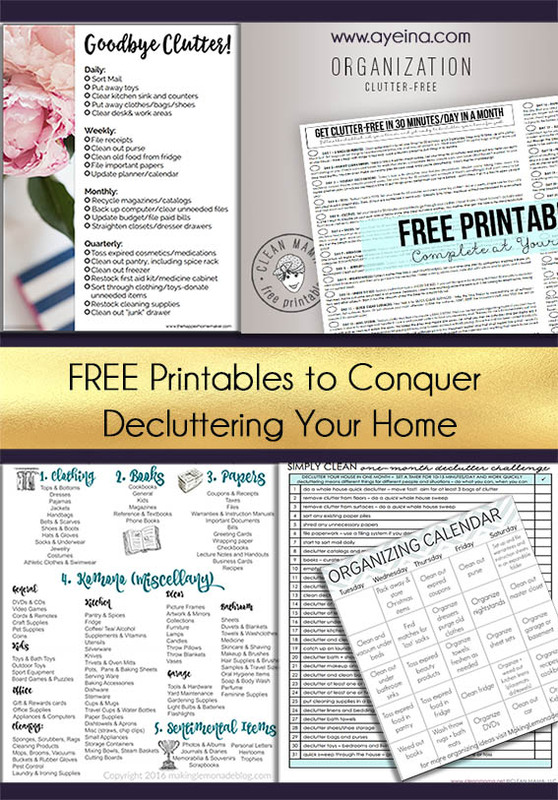 When it began to impact my state of mind – I was unable to concentrate with clutter, even if it was visual clutter, I decided I needed to tackle it head on. I attempted this in different ways. I spent entire days of getting everything out, and that resulted in cranky children, very delayed meal times and falling behind on chores because I was trapped in the midst of piles of ‘stuff.’ I experienced weeks of having things all over the place because I took too much out and didn’t have time to get to it, which caused nothing but stress and anxiety when things couldn’t be found or had to constantly be shoved out of the way to access something. Weekends or holidays were dedicated to completely overhauling the house, which happened but meant I was completely burnt out because I hadn’t taken the time to rest and in a few months, we were back to square one anyway. It took a lot of trial and error and inspiration from the FlyLady method to help me come up with a process that works, every time, and I hope these tips help you too! Kitchen: Cutlery drawer 1, Cutlery drawer 2, Saucepan cupboard, Baking supplies cupboard, Spices, Shelf – Sauces & Oils, Shelf – Grains & Lentils, Shelf – Everyday Essentials, Shelf – Hot drink supplies, Shelf – Breakfast items, Basket – Snacks, Basket – Tupperware, Fridge, Freezer. Dedicate 15 minutes a day to decluttering. If you would like to carry on for a longer period of time, combine your 15-minute sessions into longer sessions. For instance, you could do an hour and 15 minutes on one day and get several areas done or half an hour on one day and another half-hour the day after that, whatever works for you. I find doing 15 minutes every day really useful because it has now become part of my routine and something that I’ve become very mindful about. Stick a timer on, give the kids an activity and put away your phone so you are not distracted. This makes it manageable. Most people are put off by decluttering before they’ve even started because they think it is too overwhelming and too much of an uphill climb. Giving yourself just a few minutes every day to declutter one spot, means that you will get it done slowly, carefully and more importantly, mindfully. Go at a pace that works for you, that works for your family, and that works for your circumstances. During the process, you might wonder what you should do with things that you’re not quite sure you want. Always have three boxes (or if you’re in a small space like I am, use three carrier bags) and label them – ‘Donations’, ‘Family/friends’, ‘Sell.’ What you can then do, is as you go on your decluttering journey throughout the year, you always have a place to put those things that are leaving your home so that they are stored somewhere before going to wherever they end up. Take photographs of things as you go along if you are planning to sell them or offer them to friends and family. That way you can immediately send a quick message to offer it or use the image to pop it on eBay or a local selling site. Anything that is to be donated should be bagged and out of your home as soon as you’ve filled the bag. If a friend or family member has said that they would like to take an item from you, please ask them to collect it from you or take it to them as quickly as possible. 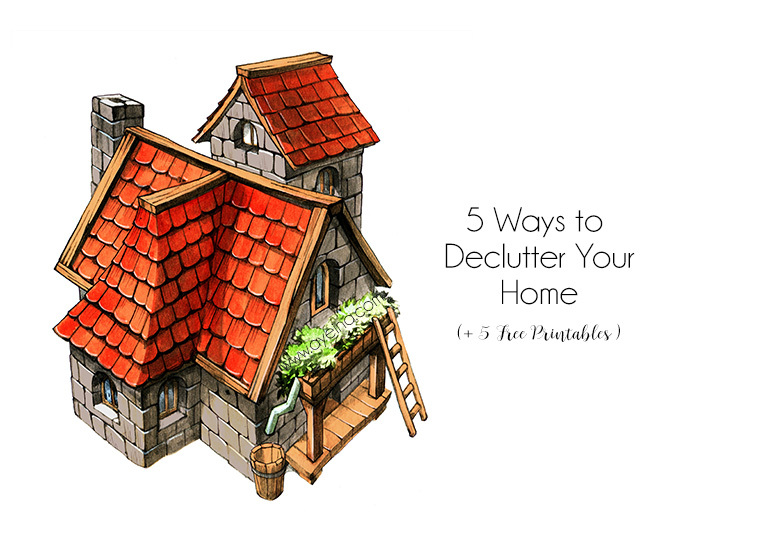 Getting the items out of the house quickly really helps so that you aren’t just adding three more bags of clutter that are now cluttering up another space. As you are decluttering, minimising and reorganising things within your home, you might be tempted to buy storage solutions to make items easily accessible. Before you drive to IKEA, organise things that you need to store in piles. Once they are in piles and you know exactly what kind of storage solutions you need – size, quantity, material, etc – look around your home to see if anything you already have will work. If you can’t find anything, go ahead and buy what you need. For example, when I was organising my children’s craft supplies, I put things into piles. Playdough, kinetic sand, sand moulds and playdough tools went into one pile. Card, scissors, pencils, colour pencils went into another, and so on. I needed to buy storage solutions because I didn’t have anything at home that would fit those things, but now when I went to make my purchase, I was making a conscious decision based on what I knew we needed so I wasn’t just buying and then wasting time by having to return things or using things that don’t actually work for the purpose for which they were intended. I also always buy storage solutions that can be used anywhere around the house – nothing in themed colours or awkward shapes that I wouldn’t be able to use in another room. Everything is interchangeable. A lot of times, I use things already within my home to organise items. Phone boxes, biscuit tins, packaging tubes, can all be given completely new looks with a little scrapbooking paper, fabric, or adhesive vinyl. All of which are inexpensive and have several uses. Remember that your home is never going to look like something off Pinterest or something from an IKEA catalogue or home décor magazine. Those rooms are designed to look that way to make the items appealing and for you to want to emulate that by purchasing their products. Homes that are lived in, loved and well used do not look like that. Again, remember that the amount of decluttering that you have to do will vary depending on the season of life that you are in. We are all in different seasons of life – those of you that have young children under the age of five, and are taking care of a family member as well for instance, may find this really difficult initially because it will seem never-ending. However, if you do it consistently, and get the family involved, it becomes more manageable compared to setting aside hours and hours of time (that you don’t have!) to feeling overwhelmed and stressed out by the process. Try not to compare yourself or your home with anybody else’s. Recognise that we are all in different seasons of life and on different journeys in our decluttering process. Tell yourself every day – ‘progress not perfection’ and you will get there every time. Author’s Bio: Iman is a working mum of two, a wife and an organising junkie. She blogs over at And then she said (www.andthenshesaid.com), where she shares the beautiful, chaotic, ever-changing life journey that she’s on through her parenting experiences, reflections, organising and creative projects, and lots of family friendly recipes. Previous articleWhen Was The Last Time You De-cluttered Your Mind?